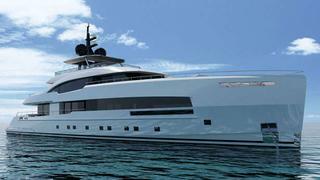 Ancona, Italy-based ISA Yachts has presented a new concept designed by Omega Architects of The Netherlands in the Yara 44 superyacht. The naval architecture is by Van Oossanen Naval Architects, and the Yara 44 is based on Van Oossanen's Fast Displacement Hull Form (FDHF). Thus she would be shallow draught motor yacht, with transatlantic range to boot. The aluminium hulled yacht has been designed in collaboration with Omega Architects and Van Oossannen Naval Architects and provides 50 per cent more usable space in comparison to a traditional lay-out. Accommodation comprises a full beam private owner’s suite with double bathrooms on the main deck, and two twin cabins and two VIPs cabins served by a central round staircase located on the lower deck, while dedicated crew cabins with their own dedicated galley are sited forward. The main deck also includes a large dining area with full height windows, aft of which through glass doors is an even larger lounge area, half of which can be enclosed with glass sliding doors. Further aft still is beach club, which includes a sauna, toilet and a service counter. Three different engine options are offered giving a maximum speed ranging from 24 knots for the basic twin MTU 16V 2000-powered version and up to 30 knots for the twin MTU 16V 4000-powered option. The Yara concept also includes plans for a larger, stretched 48-metre version using the same Fast Displacement Hull Form, but with rearranged shallow propeller tunnels.